Happy are the owners of Fairy Bikes – Velocipedes, Scooters, Tricycles, Coasters – each ride so gracefully, speedily and safely. Only Fairy Bikes are made exactly like you want them and last the way your parents hope they will. Playtime is always joytime on a Fairy. What fun you can have! Out in the glorious sun, riding here and there in the fresh air, building strong, healthy bodies. Tell Dad and Mother to get you a Fairy because a Fairy costs no more and is so much stronger and better than ordinary bikes, rides so smoothly and looks so bright and gay. The Fairy Cycle was a popular child’s bike in the twenties. It was marketed extensively both in America and Great Britain. For many folks of a certain age it provided the first means of wheeled propulsion. This bicycle was made by the Colson Company of Elyria. Ohio, USA. The company was established in 1885 by Winslow L. Fay as the Fay Manufacturing Company. 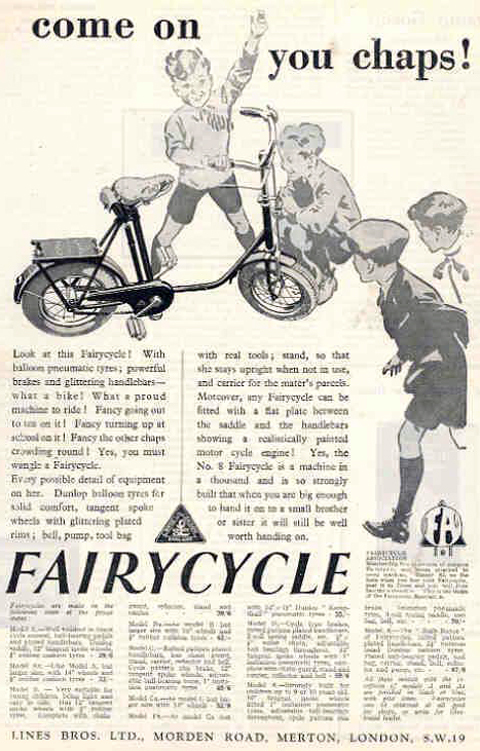 Initial products included a dirt scraper used to smooth the roads for cycling, as well an adult tricycle marketed under the ‘Fairy’ name. The Juvenile Biycles advert below is from the Fay Manufacturing Co.
Fay sold the company to Arthur Garford in 1891, and he hired a salesman by the name of Fred Colson. Colson became vice president under George Worthington (who had changed the name of the company to the Worthington Manufacturing Company). In 1917 Colson persuaded stockholders to merge the Worthington Company and another division of the Fay company to form the Colson Company. As president, Colson created a line of children’s bicycles, scooters and tricycles which were sold to hardware and department stores such as Sears Roebuck and Co under the ‘Fairy’ name. After the depression, features were added to the bicycles to differentiate them from their competitors, such as a two speed enclosed crank housing and a frame-mounted lever for gear changing. Bicycles built by The Colson Corporation were sold by many different retailers from 1917 to 1953, with Firestone and Goodyear being the biggest and most well known. Colson even made special models that were sold exclusively through these two retailers. The Firestone Cruiser and Super Cruiser were Firestone exclusives and were made only one year, 1941. The Super Cruiser pictured below was owned by the actor Sandra Bullock (restored by her husband Jesse James, and sold on their divorce). 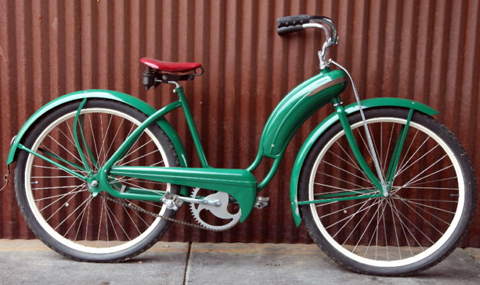 The Colson Company last made bicycles in 1953 when the bicycle division was sold to Evans. Today the Colson Caster Corporation is a member of the Chicago-based Marmon Group of Companies. Below is an advert for Fairy Cycles on the side of a Triang toy bus. Come on you chaps! Look at this Fairycycle! With balloon pneumatic tyres, powerful brakes and glittering handlebars – what a bike! What a proud machine to ride! Fancy going out to tea on it! Fancy turning up at school on it! Fancy other chaops crawling round! Yes, you must wangle a Fairycycle. The Mickey Mouse ‘Velocipede’ illustrated below was made in the 1940s. Exhibitions were held at Hotel McAlpin, New York City. These were trade fairs that showcased Colson products, as well as other companies with a tie-up with Disney. You can see the list of exhibitors further down the page. Here’s the most unexpected good news wheel goods buyers have ever received. The Colson Company has not only linked the world’s most loved character to a nationally famous velocipede …but in so doing has successfully injected into the design – ACTION! When the youngsters of America see this – your sales are going to climb to unheard of levels.